As many of you know, I started my days in the military many years ago as a humble Airman in the Air Force, and overtime, worked my way up to being (slightly-less) humble NCO (non-commissioned officer). I routinely speak at NCO Academies around the world and I’m honored anytime I get to stand up in front of these young men and women. They are doing amazing work and are at pivotal moments in their careers and lives. Being able to share some of my life-lessons with them is incredibly rewarding for me. I can’t make it to every NCO Academy though, and certainly can’t talk with every NCO out there. Or so I thought. 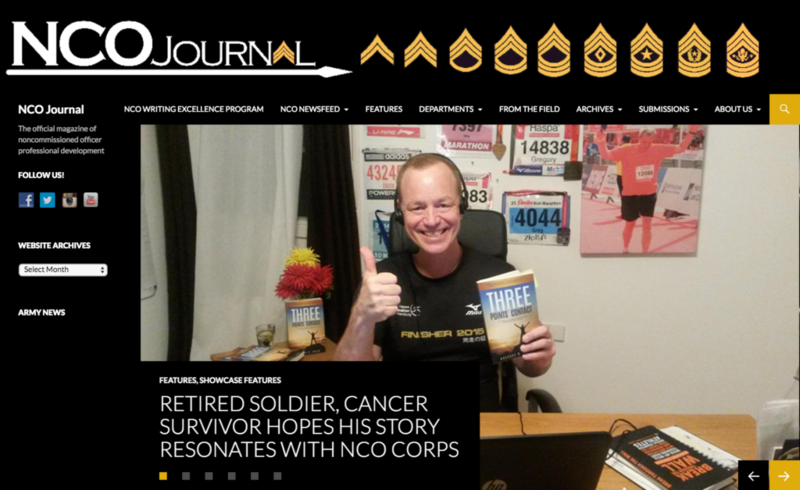 This week the NCO Journal honored me by featuring my story on their homepage. This really means a lot to me, and I hope a few more NCOs out there can hear my message, no matter where they are in their careers. You can check it out here. For those of you who are not familiar with it, the NCO Journal is the official magazine for non-commissioned officer professional development. It is published at the U.S. Army Sergeants Major Academy at Fort Bliss, Texas, and I had to pleasure of working with Pablo Villa throughout the process of writing this story. So I’m sending a special thanks to the NCO Journal and to all the NCOs and Petty Officers out there. Thank you for your service, you are the backbone of our military. Keep charging and Auf Geht’s! A couple of months ago I ran the New York City Marathon and spoke at the Marathon Expo. Before doing those though, I recorded this quick video on taking charge of your day. Since my last couple video blog episodes have been focusing on journaling, I thought this would be a good time to post this one. In this video I talk about “what is your why?” or what is the reason or thing that motivates successful people? These can be a future aspiration, or a physical reminder that gets you going. For me, when I didn’t graduate from high school I kept the empty diploma case, and it was constant reminder to me of the need to strive hard and push through adversity. In my book Three Points of Contact I refer to these things as “Bulletin Board Material” and that means you can put these things in place you’ll see them everyday and say “that’s what I’m working towards”. It doesn’t need to literally be on a bulletin board, it can be in a journal, but the point is you see it and it motivates you to keep going, especially when things get tough. Check out the video below for more tips on making this happen. Got a “why” that keeps you going? lets hear about it! Just got back from a number of speaking engagements across the US, which included the NYC Marathon Expo, the United States Military Academy at West Point, and the NCO Basic Leadership Course at Fort Carson, to name a few. I was approached by an amazing lady after I spoke at the New York City Marathon and she told me my book, “Three Points of Contact has saved her life” she asked if I would tell some short stories on some background information I presented in my book. This is the first short video and I will try to keep these around two minutes. This first video is from the chapter on Visualization and the Power of Stillness and Silence. This can be found in my book on pages 70-77. This past Saturday I ran my 8th marathon since being diagnosed with cancer, and this time I was in Hamburg, Germany. What an amazing experience! More than 750,000 spectators and 20,000 runners. I shot this quick video when I finished, in which I talk about daily exercises to improve your optimism, as well as Hunt the Good Stuff (#htgs) and University of Pennsylvania’s Army Master Resilience Training (taught by Dr. Karen Reivich). Approaching the day with optimism can be as simple as writing down three things you’re thankful for, an exercise I did for the 30 days leading up to this marathon. Give it a shot: what are three things you’re thankful for today? Write you responses below in the comments section, I’d love to hear from you. Have a Great Day and Live the Three Points of Contact! This Saturday, I’ll be running my seventh marathon since being diagnosed with cancer. Yesterday, I finished my last long training run before heading up north to Kiel, and shot this quick video. Enjoy! Some of the marathon training references I talk about in the video are Trevor and Angie from Marathon Training Academy, Jeff Galloway’s Run Walk Run method and the training timer I use is Gym Boss. You can live ANY goal you set out to achieve.